Britons heading out for skiing holidays in Europe this winter are being advised to take a few simple precautions to protect their safety. Staff at the Foreign & Commonwealth Office (FCO) in Marseille are launching a safety campaign for British skiers and snowboarders after data from France showed there has been a high rate of accidents on the slopes in 2012. FCO consul Simon Taylor said a lot of Britons had suffered serious injuries. 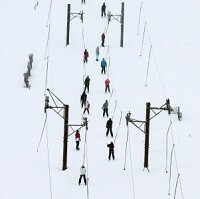 "Don't make the mistake of assuming you'll be fine if you're with more experienced skiers or snowboarders," he advised. "It is significant that a large number of cases we have dealt with have involved off-piste skiing." FCO research suggests the vast majority of Britons going on winter sports holidays class themselves as a beginner or intermediate, with just 1% believing they are at an expert level. Around two out of three (65%) winter sports holidaymakers said they would ski or snowboard on slopes beyond their experience level in order to stay with a group, while more than half (53%) admitted they would follow a group of friends off-piste. The findings underline the importance of taking out appropriate ski travel insurance for winter sports holidaymakers as well as taking sensible precautions while on the slopes.